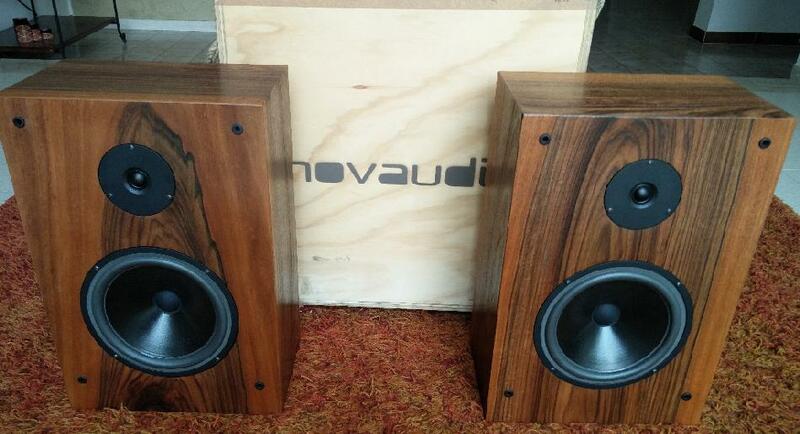 Novaudio is an Italian company that makes audio design and handmade audio-furniture. Our choice as an handicraft company allows us to offer unique works and a high quality standard of sound. Actually, they design and hand-craft several different audio components and accessories, including a series of audiophile loudspeakers. 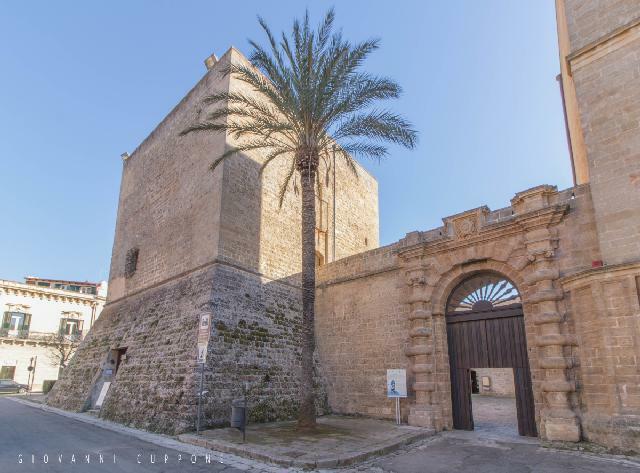 Some of their designs have been recently displayed at the Biennale di Arte contemporanea di Venezia, a famous art exhibition that takes place in Venice, Italy. Novaudio is the creation of Giuseppe Maietta, an artisan who lives and works in Galatone, a small town in the South of Italy. Certainly, Giuseppe has innovative ideas on combining classical and modern design, using wood as a primary element. 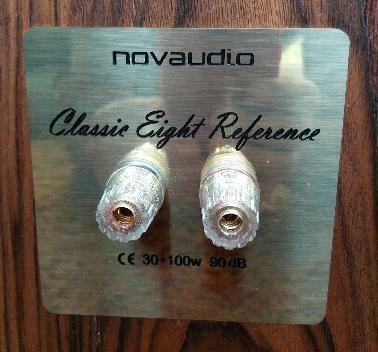 His line of speakers called “Classic” comprises three models: Classic Five, Classic Eight and Classic Eight Gold, where the number identifies the size (in inches) of the woofers. The “Gold” is a floorstanding model, whereas the Five and the Eight are bookshelf-sized, more or less. I've been asked to review the Classic 8 Reference, a mid-sized bookshelf loudspeaker, inspired by some classic speakers of the past such as the Snell Type J, some AR model, Advent and many others. The Classic 8 Reference is a mid-sized acoustic suspension bookshelf loudspeaker, equipped with a 8" woofer (apparently a Vifa) and a 3/4" silk dome tweeter. The cabinet consists of solid birchwood panels, with internal reinforcements and walnut or cherrywood finish. The crossover network uses paper-in-oil caps and is damped with glue. Internal wiring makes use of 2.5 sqmm unbranded OFC cables, and monowiring is the only available option, as in the good ol' days. The cabinet is very solid and shaped like the speakers which inspired its design, i.e. it has a limited depth, when compared to the width of the baffle (20 cm vs 32 cm). These speakers are meant to attract those nostalgic audiophiles who hate modern, small, bass-reflex designs with small woofers. A 8" woofer with rubber foam surround, with an acoustic suspension, is the way to go if you wish to rediscover some typical traits of the sound of the Sixties and the Seventies. What's the point in designing an acoustic suspension loudspeaker, when the vast majority of loudspeakers uses bass-reflex enclosures? Roughly speaking, in an acoustic suspension design, the air inside the cabinet acts like a “brake” or a “spring” for the excursion of the membrane. An effect of this fact is that the slope of the frequency response below the resonance frequency is less steep than in a bass reflex design (12 dB/oct versus 18/24 dB/oct). On the other hand, bass relex designs have more bass output (for a given driver) and a slightly deeper frequency response. The bass of an acoustic suspension is said to be faster and more controlled, perhaps even less distorted. There are no noises coming from the reflex port and the “spring” action of the membrane suspension is reinforced by the spring effect of the air inside the cabinet. Actually, the bass of these Classic 8 speakers under test is quite fast and controlled, though not exactly deep. It is claimed to reach 42 Hz (@ -6 dB) but deeper bass lacks some weight and slam. Agile is the adjective that comes to mind when listening to these speakers. Electric bass and double-bass notes are quick and articulated, but sometimes they are affected by that one-note behavior that I don't like much. I prefer a slower bass response, with a richer harmonic content of the main notes. The upper mid-bass is a bit dry and sometimes thin, hence male voices appear less fat and masculine than they should be. Perhaps the woofer has been forced to cross the tweeter at a very high frequency, I don't know. The final result is that voices are clear and undistorted, with good presence but, from time to time, they seem to lack authority and weight. It is not an unpleasing effect, as it is a characteristic of these speakers. The high range is transparent, undistorted and well defined, and it is easy to detect a huge amount of detail. On the other hand, I'd have preferred a richer harmonic content. Cymbals and even the highest pipe organ notes seem to lack their tonal richness: they are clear and undistorted, but slightly poor in harmonic content. Overall, the tonal balance of these speakers is on the neutral side and their equilibrium reminds me of the vintage speakers that inspired this design. If that was the goal to achieve, the designer got it right! Not exactly made to impress, they can still sound unfatiguing and intriguing. No biwiring allowed for these “new” classic speakers! If you're searching for a fast and dynamic sound, you won't be disappointed by the performance of this Classic 8 Reference. The large 8" woofer and the sealed enclosure deliver a quick and agile sound: dynamic variations are handled effortlessly and without distortion, even at high listening levels. They won't shake your floor, because of the limited frequency response and output in the bass, but they will sound emotionally involving nevertheless. Their sensitivity is quite high, so they will sound pretty loud even with few watts, hence they can handle highly demanding tracks with ease. A large baffle is not exactly the ideal solution to make the speakers disappear from the listening room. Nevertheless, these speakers image quite well, with a proportionally correct soundstage, whose depth is heavily affected by the distance from the rear wall. If you wish to give the bass some boost, you need to move the speakers closer to the rear wall. This destroys the depth of the image, so you need to perform various trials and errors in order to find the right compromise that works better in your listening room. Considering the size of the cabinet, you need to use low stands, ranging from 40 to 60 cm of height, depending on the height of your listening seat. The height of the image isn't exactly breath-taking, but still reasonable. The manufacturer has just told me that on future releases of the Classic 8 the tweeter will be elastically decoupled from the baffle, in order to improve imaging precision. In any case, as imaging wasn't a big deal during the period these speakers are inspired from, I consider their performance in this area enjoyable even under modern requirements. Not their forte, but they're still adequate. Choosing the right stands is mandatory, avoid 60/70cm stands or the bass range will sound too dry and light. To find the perfect balance of bass and 3D imaging, experiment with different distances from the rear wall. Considering these are sealed boxes, you can even decide to put their back against the rear wall, as it was common practice in the Seventies. You will destroy imaging, but you will earn some extra slam and presence in the bass. As for partners, considering the 90 dB sensitivity, you don't need high powered amplifiers, and the manufacturer dares to suggest even a 10 watt single-ended tube amp to drive them properly. Depending on your needs, in terms of sound pressure level, and on the size of the listening room, it might be worth trying. For my taste, a solid state 40-50 watter is the best compromise. Slow and warm tube amps can be harmful to the natural speed of these speakers. 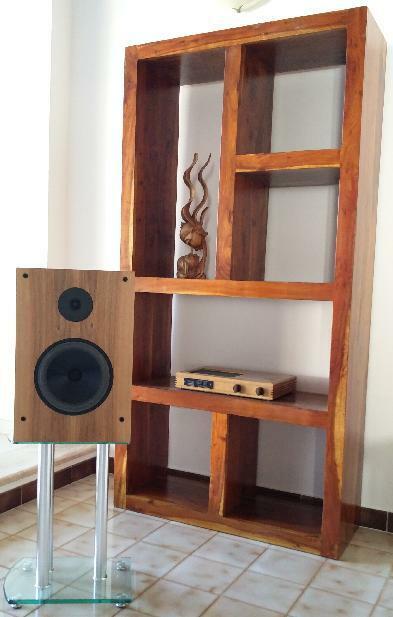 These speakers are handmade in Italy, using top quality materials, hence there's very little to complain of. Beautifully finshed and crafted, so it is hard to find a fault. Even the wooden box they are contained into and shipped is a piece of art. In my demo units the usual owner's manual was missing. 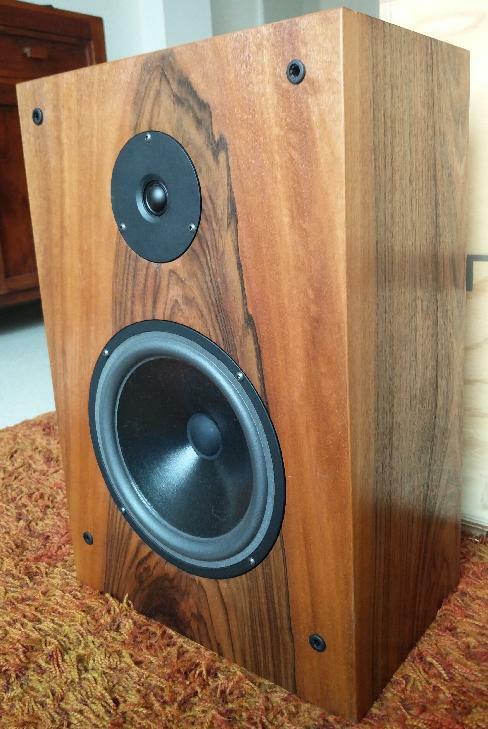 Considering these speakers are entirely handcrafted in real wood (no MDF!) in Italy, the asking price (1900€/pair) has to be considered reasonable. For 2000€ you can purchase the bundle speakers + stands. Not the usual sound you might be familiar with, but exactly what the designer intended to achieve, I think. If you wish to have deep and floor-shaking bass, look elsewhere. Harmonic richness in the upper bass and in the highs could be bettered, in my opinion. Imaging is adequate, but not on a par with that of smaller and similarly priced bookshelf loudspeakers designed using a modern approach. Any nostalgia for the golden days of audio out there? These could be the right speakers for you! A clean and fast musical performance, with few and tolerable shortcomings. Vintage sound, redesigned.